For these Sami reindeer herders, the times, they are a changin’. (c) Michiel van Niemwegen/Flickr. Oil and gas. Uranium and rare earth metals. Cod and shrimp. Reindeer and seal pelts. These things constitute the bulk of discussions about Arctic resources, yet there’s one resource that’s overlooked: time. 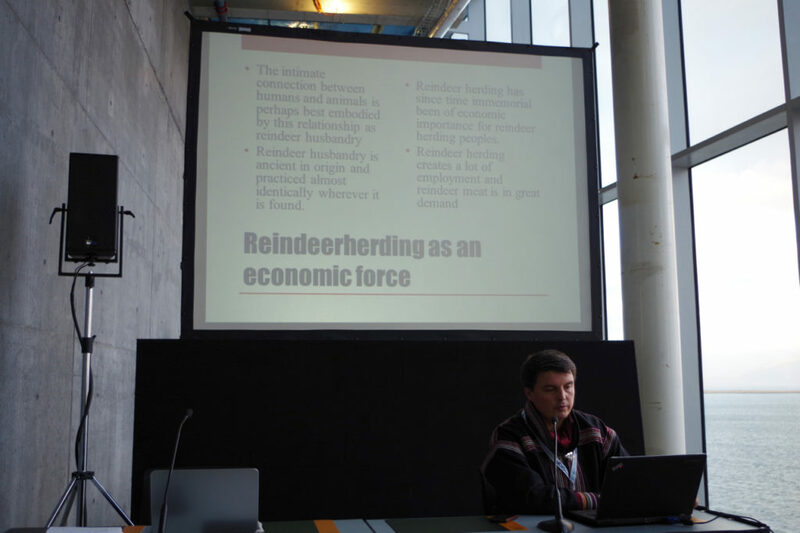 At the Arctic Circle summit in Reykjavik earlier in October, economist and Sami reindeer herder Anders Johansen Eira gave a talk, “The Challenges of Sami Reindeer Husbandry,” to about thirty people in a small, cement walled room floating over Faxaflói Bay in Reykjavik. The audience at the “Hunters and Fishermen” breakout session paled in comparison to the 900-odd people who listened to the plenary sessions in the main conference hall earlier that day. While many plenary speakers at Arctic Circle trotted out tired statistics about the 13 percent of global undiscovered oil in the Arctic or the 40 percent shorter shipping route between Europe and Asia, Eira had something new to say: time is of the essence for reindeer herders. Outside interests are not only encroaching on their pastures, but also on their time, a resource trickier to value than oil or gold. Economists measure time in opportunity costs. Essentially, time once spent tending to reindeer is now lost to travel and meetings. As an economist, Eira had crunched the numbers. He calculated that he spends 39 hours a month traveling and meeting with external interests. “I spend a lot of time meeting with mining and outside interests. And who shall do the reindeer herding then?” he asked. Travel and meetings require both the presence and time of reindeer herders. To outsiders, reindeer herding may seem like a slow way of life in rhythm with the earth’s seasons, unchanged for thousands of years and requiring little manpower. Historically, it differed from cattle ranching, where a lone cowboy could rustle up the whole herd. Instead, five to six families helped manage a reindeer herd. Now, though, at least with the Sami, an individual often manages a herd while his family lives in permanent housing. So when Eira is gone, then it’s unclear who can take over his responsibilities. Time, too, is of the essence for reindeer herding. Every day matters for making progress with the herd. Piers Vitebsky, an anthropologist who lived with the Evenki reindeer herders of eastern Siberia, observed: “They had been on the move and under exceptional pressure since April. The next site, too, would be a hurried stay, and it would not be until autumn pasture, two sites on, that they would have time to linger” . But Eira has to travel to these meetings. Securing rights over land within siida (Sami reindeer foraging areas) and resources is a fundamental prerequisite to maintaining reindeer herders’ way of life. 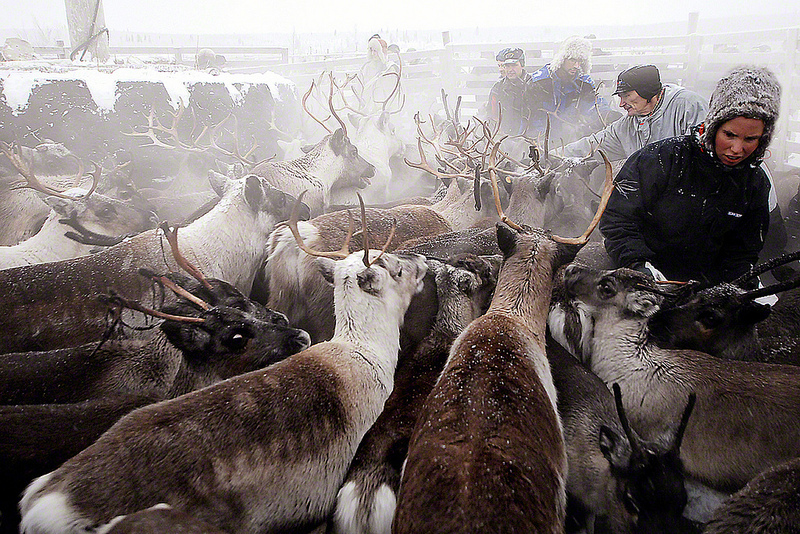 Reindeer herding is an economic force, but it’s also a distinct culture. The only way that these rights – and their way of life – can be kept from the onslaught of miners, road builders, and tourism boosters is through consultation. But in northern Norway, reindeer herders and industry CEOs can’t just take a cab to a board room on Fifth Avenue or hop the tube to Canary Wharf. Travel requires significant amounts of time and arrangements. And most of the time, reindeer herders have to travel to urbanized centers. Industry leaders don’t come out too often to the tundra or taiga to talk shop. “The processes steal business time from reindeer herders. Instead of developing our own businesses, we have to sit in meetings with our ‘guests,'” Eira disparaged. At least in northern Norway, and indeed within Sápmi, the area that the Sami inhabit from northern Norway to the Kola Peninsula in Russia, distances are short enough that travel to meetings still is possible. In the vast expanse of Siberia, for instance, where roads, railroads, and flights are few and far between, it would be even more difficult for reindeer herders like the Nenets, Eveny, or Komi to travel to meetings with industry. Reindeer herders are nomadic people, so they are used to constantly moving. But distances in Siberia are measured not in hours, but days. When National Geographic went to do a story on the Komi people, for instance, it took an eternity for the journalists to reach the reindeer herders. “We’d been traveling for days—by train from Moscow, helicopter from Arkhangel’sk, and now snowmobile from the village of Nizhnyaya Pesha in northwestern Russia,” Gretel Ehrlich writes. That said, for reindeer herders in Russia, the issue of travel time is probably secondary to the fact that Moscow makes many decisions to develop northern resources centrally rather than involving indigenous peoples. The Arctic is a strange place where time and distance often seem to be shrinking. Trans-polar flights across the Arctic, which restarted in the early 2000s after a hiatus during the Cold War, shorten flights between places like New York and Hong Kong. Within the Arctic, IcelandAir now connects Reykjavik and Anchorage in six hours during summer. Meanwhile at sea, shipping companies like Eimskip and COSCO herald the advent of the Northern Sea Route, which will facilitate faster trade between East Asia and Northern Europe. All of these faster connections, however, benefit people like industry leaders, politicians, and academics flitting from one Arctic conference to the next (guilty as charged). While bush flights in places like Alaska are of great use to local residents, there isn’t an extensive aviation network within Sápmi. Regardless, reindeer herding still relies on human and animal-scale movement across the surface of the earth – not jumbo jets that compress time and space. When the USSR collapsed, the unprofitable state-sponsored aviation network disappeared, too, causing immense isolation for a people that had grown used to its associated conveniences. Planes and helicopters had formerly played a significant role in the lives of many reindeer herders by bringing their children to boarding schools via helicopter or delivering sugar, flour, and alcohol, but no longer. 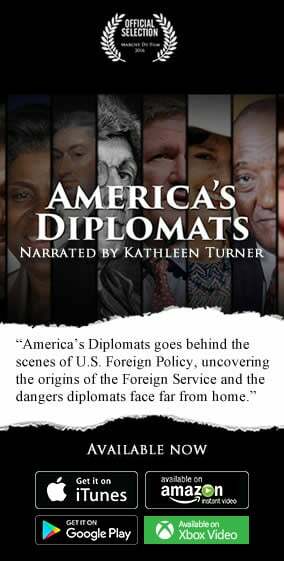 Speaking of the South Pacific, geographer Doreen Massey, quoting writer Dea Birkett, noted, “Air travel might enable businessmen to buzz across the ocean, but the concurrent decline in shipping has only increased the isolation of many island communities…Pitcairn, like many other Pacific islands, has never felt so far from its neighbours” . L: 2000-2014; R: 2045-2059. Darker colors represent longer travel time; notice more darker colors on land by mid-century. From S. Stephenson, L.C. Smith, J.A. Agnew, “Divergent long-term trajectories of human access to the Arctic,” Nature Climate Change 1/3 (2011). More scientists are paying attention to the value of time in the Arctic. Scott Stephenson, a doctoral researcher at UCLA, along with Drs. Laurence C. Smith and John Agnew, concluded in a Nature Climate Change article in 2011 that while climate change is rendering maritime access faster and easier in the circumpolar north, travel across land is becoming more difficult. Ice roads will not last as long, making it harder for mines to resupply their facilities. Melting permafrost will also make the land more challenging for reindeer herders and their animals to traverse, whether as they search for new pasture or travel to meetings with “guests” of their land. 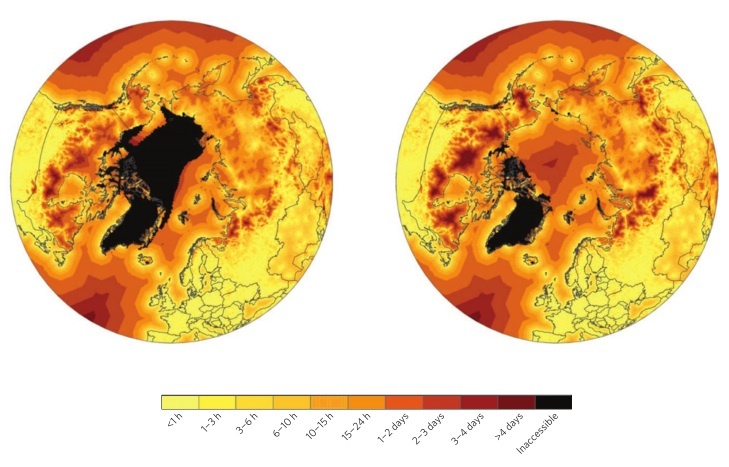 People say the clock is ticking when it comes to climate change. But the reindeer herders already know this. As developments encroach on the siida and the ground melts beneath reindeer hooves, time will be even more of the essence for these people of the north. P. Vitebsky, Reindeer People (London: Harper Perennial 2005) p. 105. D. Massey, Space, Place, and Gender (Minneapolis: University of Minnesota Press 1994) p. 148.